When the weather gets nice, you’re going to want to be outdoors more often. Just think that if you’d like to be outside to get some fresh air and sunshine, then it’s safe to assume your pup would like to be outside with you. 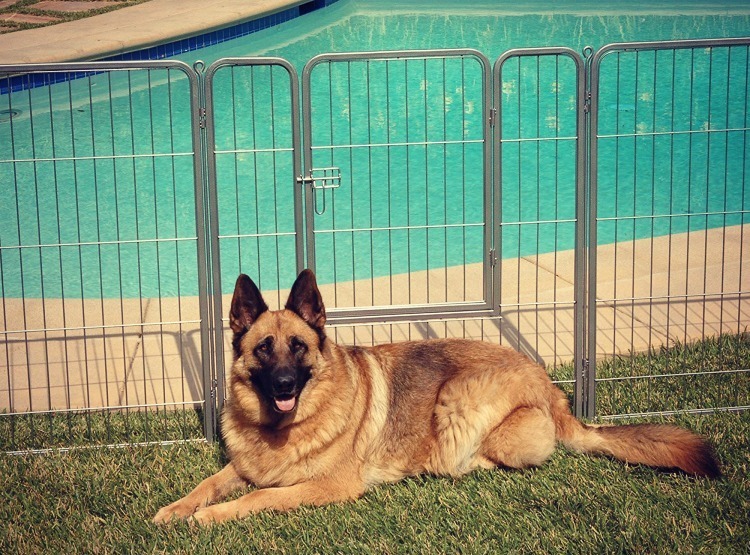 Now if you’re looking for a way to keep your dog contained while out in the yard but you don’t have a fence, then perhaps you might find the Precision Pet Courtyard Kennel quite useful. In this review, we are going to talk a little more about the features of the Precision Pet Courtyard Kennel, but we are also going to give you an overview of what people who have purchased the kennel had to say about their overall experience with it. Then, we’re going to give you our recommendation on whether or not this dog kennel is something you should consider purchasing for your own pup! 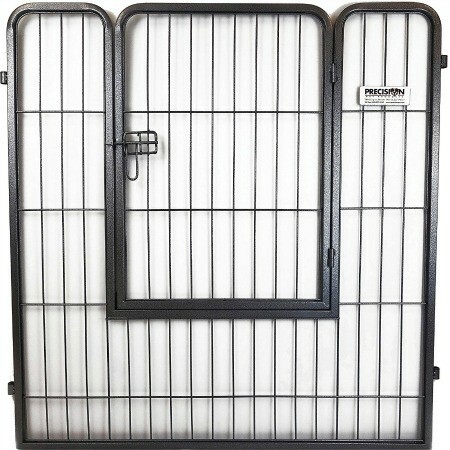 The Courtyard kennel is going to your solution to getting your dog outside and into the fresh air. The unique design of this kennel allows for maximum versatility when it comes to configuration, how it is used, and storage. 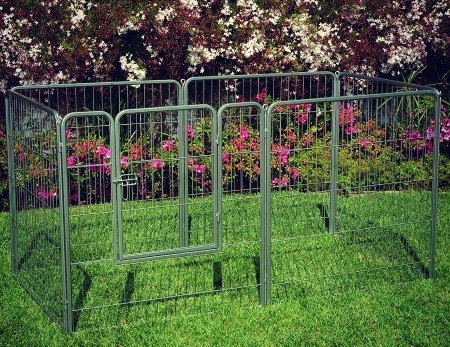 Each kennel comes with six 38” high, 3’ wide wire panels that can be fit together to create a spacious area for your pup. One of these panels feature a built in gate for easy access. The Courtyard kennel is made from durable, rust resistant galvanized steel that has been finished with a silver crackle finish. To keep the panels together, you will want to use the long and short corner pins—the long pins to secure the kennel in the ground while the short pins can be used on harder surfaces. The pins are designed so that they can slide into place easily without the need of other tools. And when you don’t want to use the kennel, remove the pins and it all folds down flat for easy storage. When looking at what people had to say about the Precision Pet Courtyard Kennel, people were impressed by how sturdy the unit is when it has been put together. One customer said they had to carry each panel out on its own because it was so heavy—the box when it arrived weighed more than 70 pounds! Customers liked that you didn’t need any extra tools to put the kennel together because all you had to do was slide the pins into place. People have said that they preferred this type of kennel over an enclosed one because it doesn’t seclude the dog. Some have said that they used this kennel to keep their dog confined so they can heal after a surgery, but others have stated that they could put their healthy dog in the kennel without worrying about the dog trying to escape. While there are many people who love this kennel and it works well for them and their needs, there were some folks where were not happy with the kennel at all. One customer pointed out that their pup’s collar got caught in the loops that are used to hold the crate together. We do want to point out that you don’t want to put your collared pet inside a kennel because of this very thing. This is a detail many pet owners tend to not think of, and it could be disastrous. Other complaints customers had about this kennel was that the gate latch could easily be manipulated by a smart dog and they could get out. Another customer said that the gate on their kennel was completely unusable and they needed to take the section to a welder to have it repaired. As a whole, customers enjoy the kennel, but if you have a large breed, it may not be the best option because the walls aren’t very high. Searching for a kennel for your dog can be a little confusing because there are so many options available on the market today. Depending on what you’re looking for and the kind of dog you have, some options are better than others. The Precision Pet Courtyard Kennel is going to be a kennel best suited for small dogs who won’t be able to jump over the walls of the kennel, or dogs that are kennel trained. While the kennel may be relatively heavy and your pup may not be able to break through it, it’s a good idea to be mindful of the latch, which can be opened relatively easily, especially if your dog is pretty smart and likes to jump. For a kennel being priced under $200, we feel that this is a nice option. Due to its effortless assembly and the fact that you can take it down and put it up without any extra tools, it can be moved from indoors to the outdoors easily. This makes it a great option if you like to go camping but you don’t want to keep your dog on a leash the entire time. As a side note, we do feel like it is important to reiterate that you should never put your dogs in a kennel with a collar around their necks. By leaving their collar on, they have a chance of getting caught on the poles that hold the kennel together. Keep your pet safe by removing their collars, especially if you aren’t going to be watching them while in the kennel.